The Inn at Mt. Chestnut was completed in 2001 and is ready to give you the "rest of your life." Being built specifically as a bed and breakfast allows us to offer our guests all the comforts of today while also evoking the charm and relaxation of a bygone era. Of course, all of the guest rooms have their own private bath, king size beds, air-conditioning, cable TV, and even high-speed cable Internet access. Even though the Federal-style inn is located on 20 wooded acres, just west of the city of Butler, it is only 30 miles north of Pittsburgh and 1/2 mile north of U.S. Route 422 off North Road. We are only 10 minutes east of Interstate 79, near Moraine State Park, Lake Arthur and McConnell's Mill State Park. 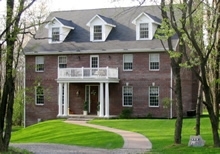 Although the inn is quiet and private it is very convenient to area restaurants, shopping areas and major highways. We have four wonderful guest rooms with four different themes and two common areas to sit and relax.